Sakhar bhaat or kesari bhat is a Indian sweet rice recipe made with sugar and rice as main ingredients. This sakhar bhat is a Maharashtrian recipe made on festival or any celebration day. Sakhar bhaat is easy and does not take very long time. 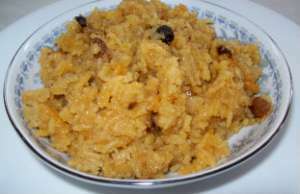 It is also known as kesari bhat because of the added kesar (saffron) which gives it orangish / yellowish color and the saffron flavor. 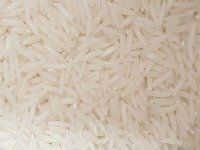 The variety of rice used is preferably basmati but any other white rice can be used as a substitute. The cooked Rice should not be mushy, each grain should be separate. You may also visit Narali bhaat - sweet coconut rice which is made with jaggery and rice. Narali bhaat is made on Narali paurnima (full moon) day. Wash rice till water runs clear. Drain and keep aside for about 30 to 60 minutes (longer is better). Chop dry fruits in pieces or slivers. Heat ghee in a pan on low heat. Be careful not to overheat as ghee burns fast. Add the dry fruit pieces and fry for a few seconds. Remove the dry fruit pieces onto a plate and keep aside. To the same ghee, add cloves, cinnamon. When they splutter a little, add washed and drained rice. Lightly fry for a minute. Add boiling hot water and stir. Cook covered on low flame till rice is just done. Remove the cooked rice in a big flat plate and spread to cool. Handle rice carefully so as not to break the grains. In a thick bottom pan, mix water and sugar. Cook on a slow flame to form sugar syrup. Boil for about 5 minutes. Take a bowl of cold water, drop a drop of syrup in the water, if a semi hard ball is formed, syrup is ready. Add strands of saffron (kesar) in the sugar syrup. In the ready syrup, add cooked rice, lemon juice, and chopped nuts and stir carefully to mix. Cover and cook until sugar syrup is absorbed in the rice. The rice will thicken. Cover and keep for about 5 minutes. Serve hot or cold. It is delicious any way. It tastes good the next day too. When you add enough kesar (saffron), you do not need to use the orange food color. Add more or less chopped nuts according to your choice. More nuts make the dish richer. In case you do not have saffron (kesar) strands, you may use orange food color. Just use a pinch. Or you may omit it to let the rice have natural color. You can keep this rice at room temperature for two days. Or keep it in the fridge for 5-6 days. Though it is made most of the times with freshly made rice, especially on festival days, you may also make it with left over rice. To save time, after frying washed rice in ghee, you may cook rice in the pressure cooker to save time. Cook only for one whistle. Once the rice is ready, while the rice is cooling, you can make the syrup. When you add enough kesar (saffron), you do not need to use the orange food color. If you are making this for a festival, you may use fresh rice. At other times, You may use leftover rice. It is generally a bit dry than freshly cooked rice. You only have to make the syrup and it gets ready fast.